Alas, I lost my fabulous deviled egg platter to this Halloween party I went to. 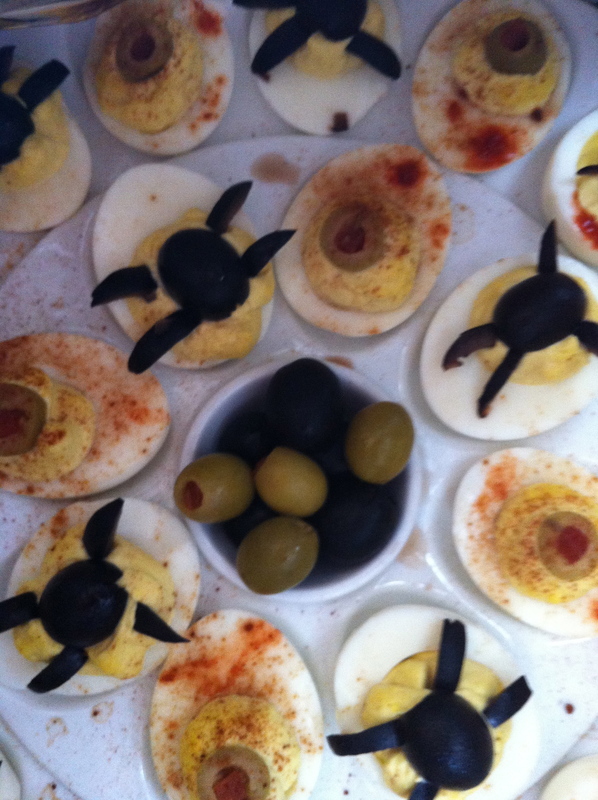 I decided deviled eggs always go well at a party. White trash to high-class they make a good nibble! I decided my 24 egg holder would work. I looked up different ideas online and decided on making spooky eggs. I don’t really follow recipes but do look things up for ideas. I needed a dozen eggs to hold in this fabulous tray I lost… I made more just in case they broke in the boiling or in the cutting in half, which sure enough some eggs didn’t make it to the platter. 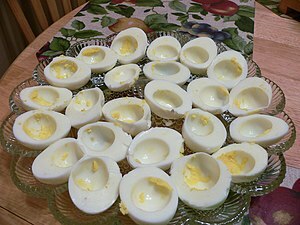 I boiled 15 eggs basically by putting them in cold water, a splash of vinegar, then letting the water come to a boil. Once it came to a rolling boil I took the pot off the heat and covered it, letting it sit for 20 minutes. After that I soaked the cooked eggs in cold water and let them come to room temp, before peeling. You can cook the eggs ahead of time to make it easier on preparing for a party and letting them cool in the fridge or on the counter. Funny, in the US people refrigerate eggs cooked and uncooked but in the rest of the world, eggs sit on counter tops and in pantries. At the grocery market in Europe you won’t find the eggs in the refrigerated section, but rather sitting out on a shelf. Once the eggs are cooled, I then cut them in half, used the best looking and stongest ones for the fabulous platter. Put all the yolks in a boal and add 2 heaping spoons of mayonnaise, a small spoon of Dijon mustard, salt and pepper and mashed it all up to a smooth yellow paste. Add the yolk mix to a pastry bag and pipe them into each halved egg white. To decorate cut rounds of green pimento olives to look like eyes and add powdered paprika on top for a good bloodshot effect. For the spider eggs -cut a black pitted olive in half then used the 1/2 and cut 4 strips to make legs. I put the 1/2 on top of the egg then put the little legs around making a cool spider. Sure spiders have more than 4 legs, but really, its halloween and I’m not Martha!